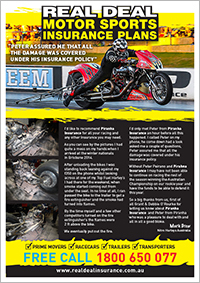 I’d like to recommend Piranha Insurance for all your racing and any other Insurance you may need. As you can see by the pictures I had quite a mess on my hands when I arrived at the winter nationals in Brisbane 2014. After unloading the bikes I was standing back leaning against my f350 on the phone whilst looking across at one of my Top Fuel Harley’s I had there for the weekend, when smoke started coming out from under the seat. In no time at all, I ran passed the bike to the trailer to get a fire extinguisher and the smoke had turned into flames. By the time myself and a few other competitors turned on the fire extinguisher’s the flames were 2 ft above the bike. We eventually put out the fire. I’d only met Peter from Piranha Insurance an hour before all this happened. I called Peter on my phone, he come down had a look asked me a couple of questions, Peter assured me that all the damage was covered under his insurance policy. Without Peter Peirano and Pirahna Insurance I may have not been able to continue on racing the rest of the season winning the Australian Championship on our rookie year and have the funds to be able to defend it this year. So a big thanks from us, first of all Grant & Debbie O’Rourke for letting us know about Piranha Insurance and Peter from Piranha who was a pleasure to deal with and all in all a good bloke. 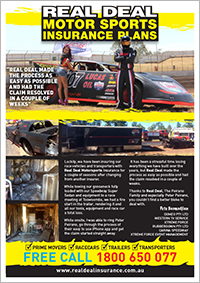 Luckily, we have been insuring our race vehicles and transporters with Real Deal Motorsports Insurance for a couple of seasons after changing from another insurer. While towing our gooseneck fully loaded with our Speedway Super Sedan and equipment to a race meeting at Toowoomba, we had a fire start in the trailer, rendering it and all our tools, equipment and race car a total loss. years, but Real Deal made the process as easy as possible and had the claim resolved in a couple of weeks. Thanks to Real Deal, The Peirano Family and especially Peter Peirano, you couldn’t find a better bloke to deal with.